Let’s start off with a bit of action. 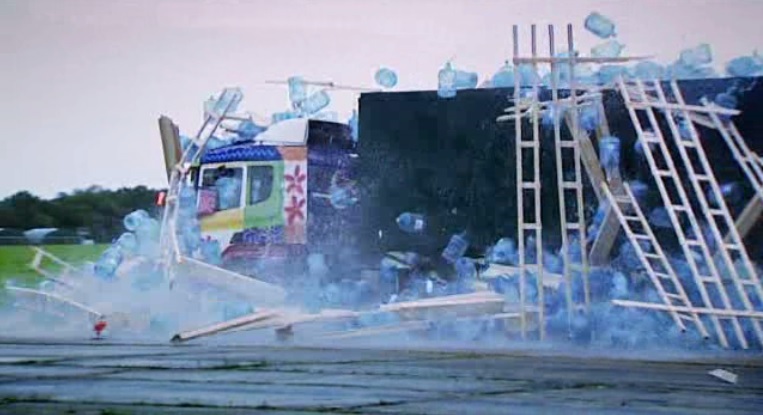 This is James May from BBC’s Top Gear blasting a semi truck through a wall of 5 gallon water jugs. But most 5 gallon water jugs live a much more laid back lifestyle. They lounge around in offices and waiting rooms from coast to coast, bubbling happily when emptied into tiny paper cones. The office water cooler is sort of a forum where office politicians can campaign for improvements such as higher quality coffee. The office water jug is technically a “carboy” though most people outside the homebrewing world won’t recognize the word. Serious carboys are made of very thick glass and are extraordinarily heavy, which is why plastic ones are much more popular. In recent years, water jugs have started sprouting handles. It’s such an obviously great idea it makes you wonder why no one thought of it earlier… It’s sort of like self-adhesive stamps – what took them so long? There’re a few variations on the water jug. I’m sure you’ve seen this fellow around – it’s not so much a “jug” as a “bladder.” Amazon calls it the “water carrier,” but I prefer bladder because it’s a bit more naughty. They’re foldable which make them great for space saving, and more prone to sprouting irritating little leaks. The little nozzle works sort of like a shower head (a really bad one) so you could hang this from a tree and take a shower underneath if you really had no other options. This jug is friendlier on the old biceps and triceps. Instead of having to pick up the whole operation and try to pour it without spilling distilled water everywhere, it comes with a convenient tap. The best part is that it works on its own without needing an entire tower unit like the water jug above. Handle, screw top lid and spigot – it’s got it all. And lucky for you this jug gets the benefit of free shipping from Amazon – that’s a good bonus because with shipping costs can often double the base price for bulky containers. This jug ain’t trying to be something it’s not. It plays nice with most office water coolers, although check the specs before getting it shipped out to you just to be sure. 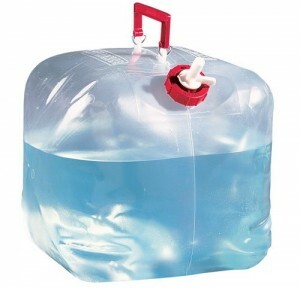 They put handles on these now, but don’t panic – they’ll still hold 5 gallons of liquid and then some. 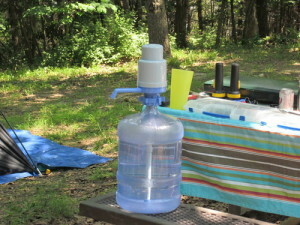 And if you still want to get water up out of the bowels of this jug without exerting yourself, check out this jug pump. 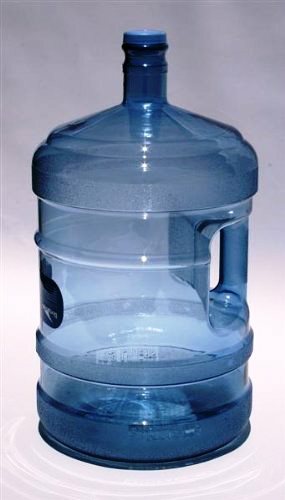 Like with many things sized in 5 gallons, the 5 gallon water jug is popular with preppers, who use them to store years of water. A person needs at minimum one gallon of water each day, making the math very easy. If you want a supply of water that lasts 365 days, you’ll want 365 gallons of water. That’s 73 of these things full. You’ll most likely want to store these in a cellar on solid earth, since that much water weighs one and a half tons. And remember that if you’re storing your water in plastic for that long, your water will taste a little bit … like plastic. The guys from global buckets have made a sub irrigated planter based on one 5 gallon bucket and one 5 gallon water jug. 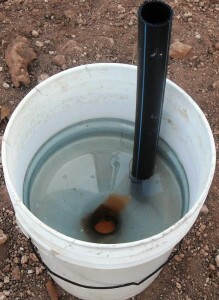 They developed the idea it because in african villages, 5 gallon buckets are so valuable that a villager would never dream of drilling holes in one. But apparently old 5 gallon water jugs aren’t nearly so useful, so maybe it’s ok to cut them apart. You’ll find more details about their water jug planter on GlobalBuckets.org. 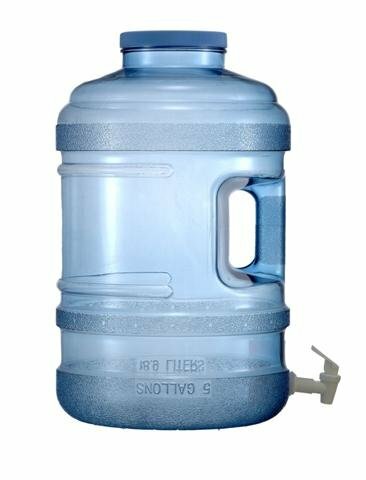 Buying your very own 5 gallon water jug will set you back about 20$ if you buy online. That’s significantly more than a standard 5 gallon bucket, for the privilege of a narrower neck and lighter duty plastic. You can get them cheaper offline. Many grocery stores are now stocking them to sell distilled water in, so try there first. The coolest thing you can do with a 5 gallon water jug is grow Spirulina. Spirulina is a bland tasting algae unbelievably high in protein. You could survive off nothing else if you had to. Learn more about growing Spirulina in buckets. is anyone responding to these posts? I’d like to find some used bottles, too. I have about 250 of them to sale. If you are still interested. 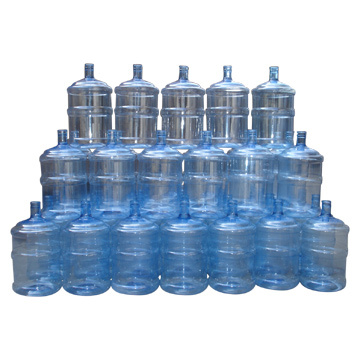 These are good Quality used 5 Gallon Bottles. Some still have the used Caps on the Bottle. I was getting a Oxygen Water Shipped to me from Oregon and they were having me ship them back to them. They quit taking them back so now I have all of these to get rid of. Do you still have water jugs for sale? I am looking for some 5 gallon water bottles WITHOUT handles. Do have any of them? Please email me. Also, are you in southern ca? Who has 5 gallon jugs to sell? Do u still have used 5 gal water bottles? How much are you selling the for? How many bottles are you looking to purchase? Please email me at [email protected] for more information or check out our website at your convenience. Email me. Have numerous used bottles for sale. Need about 8 used 5 gallon bottles with out handles to use for percussion group. 501 C 3 Non Profit. Charity that tries to provide terminally ill children and their family’s a trip or wish. We need 5 gallon water jugs for donation collections. Would prefer them to be donated but will pay if the cost is reasonable. Have about15with handle I’m in fort pierce, Florida# 352-396-0513 call me price negotiable. I have about 20 empty 5 gallon water jugs from various companies, some have handles, some do not. Looking to sell for 4$ each. Will deliver for free in Chicago land area. Are these plastic or glass? I’ve looked around for empty 5 gal jugs ( for drinking water ) and have only found the ones that come full of water that you have to return to get your deposit back. I need a bunch of empty ones for my own use , any ideas? do you still have them? Put water jugs in subject and email me. Hi, I am looking for a crystal clear 5 gallon container made of plastic with a screw lid. Loks like gloass, but made of plastic. do you still have any 5 gal jugs? I have about 20 empty 5-gallon water jugs, plastic (Crystal Springs). Would like to sell at $4/bottle. In the Central New Jersey Area. Interested in your offer. Can you email me at [email protected] so we can chat further. I’m looking to buy, at $6-$7/ea or up to $10 each inclusive of shipping. I need 3-4. With handles preferred. I will find some in the next couple weeks so if you read this after November 1, 2017, don’t bother responding but thanks anyway. Cyrus, do you still have 60 or so avail? How much each? 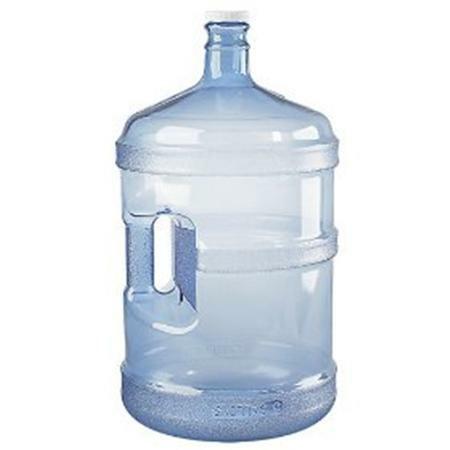 Does anyone have any empty 5 gallon water jugs/containers to sell? I’m in Atlanta. Thank you!